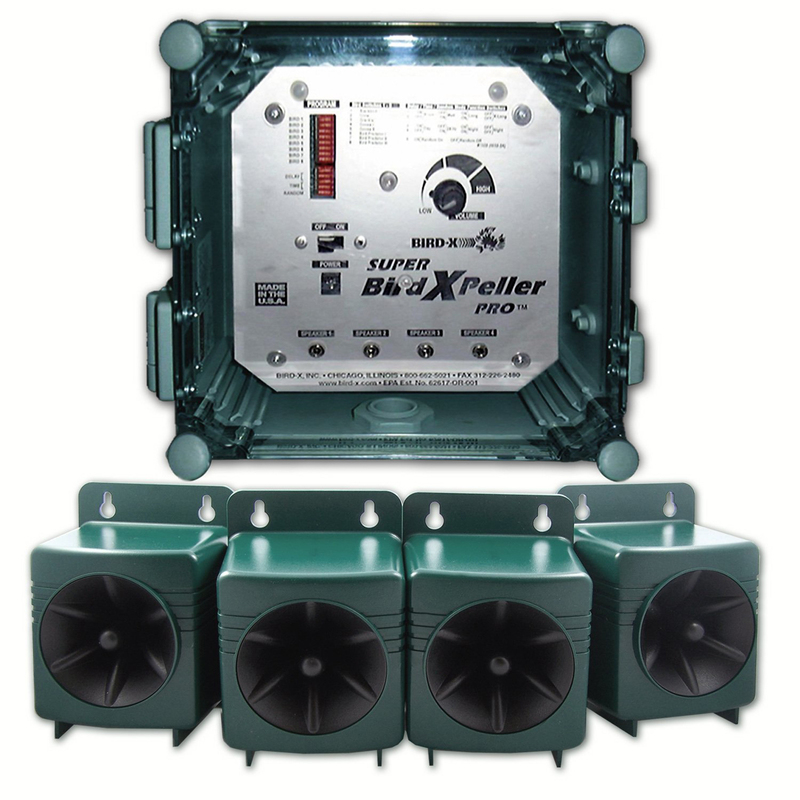 The Super BirdXPeller PRO from Bird-X uses the distress calls of specific species of birds to create a 'danger zone' - frightening away infesting bird pests for good. 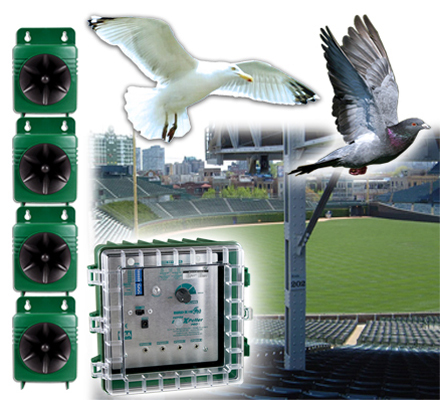 Proven and guaranteed to deter birds, the Super BirdXPeller PRO has significantly reduced or completely eliminated bird problems in thousands of deployments. Species-Specific bird repellent - Target your bird control with a species-specific approach - not scattershot. 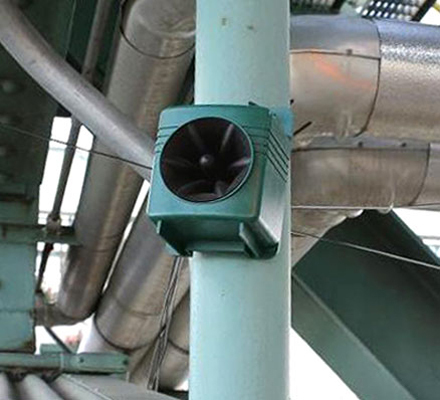 There are eight bird sounds on the unit, so choose the ones that are causing the problem! In fact, some of the eight are predator calls - if you add these to your bird control program, you'll give the birds even more of a sense of danger. Then, if you need to repel more birds in the future, simply re-program your Super BirdXPeller PRO. Easy Operation - Use with standard 110vAC electricity (adapter included) or 12 volts DC (cables included) - consider purchasing a 12vDC deep cycle marine type battery. A solar power panel accessory is available for use with a battery. Heavy-duty - Super BirdXPeller PRO is made of sturdy plastic and is a powerful directional speaker with convenient controls. Coverage - Up to 5 acres (over 2 hectares or over 200,000 square feet) at full volume, in a long oval dispersion pattern from each speaker. Super BirdXPeller PRO features birds' distress cries on a microchip (supplied by a major American University). Birds perceive danger when they hear these sounds. They become agitated and disoriented and think their flockmates are in trouble so they flee the area... never to return. 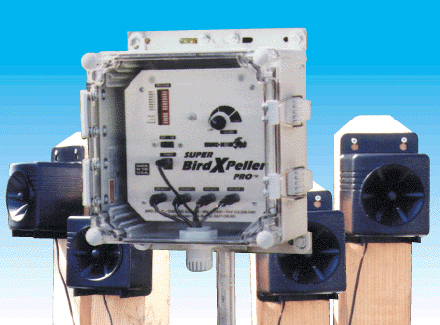 Super BirdXPeller PRO deters birds with loud, terrorizing sounds, but it doesn't harm them. 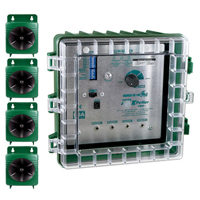 Super Bird XPellerPRO has been developed by BIRD-X, the worldwide leader in bird repellent products and systems. Dimensions: Control Unit: 9"x 9" x 5.25"
Coverage: 50,000 square feet (Sonic) at a tolerable volume for people near the speakers.